1. Diamonds that are free of inclusions are more rare and more valuable than stones with inclusions. Clarity in a diamond refers to the presence or absence of imperfections on or in the stone. The closer a diamond is to being free from blemishes or inclusions the more rare and valuable it is. 2. The GIA (Gemological Institute of America) created a Clarity Grading Scale which designates diamond clarity in a range from what we define as Flawless to Imperfect. 3. 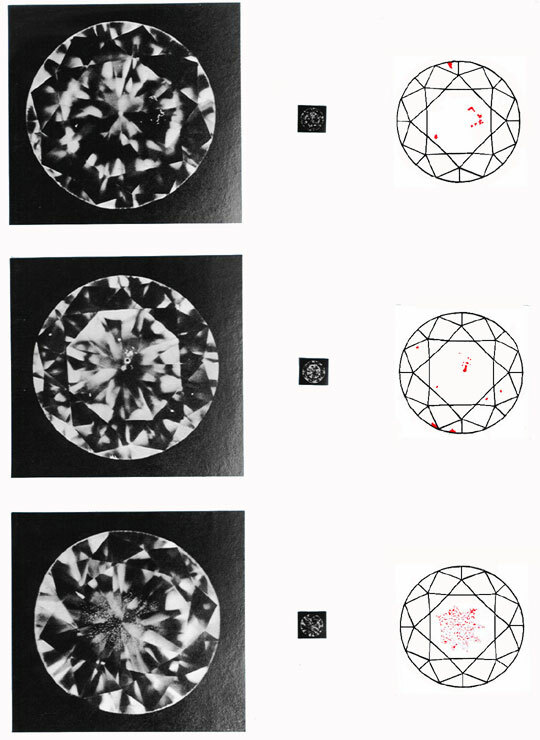 The GIA Clarity Grading Scale on the right shows the progression of the clarity grades as inclusions get larger and more numerous. 5. Almost unnoticeable differences in clarity between two diamonds can make a difference in value of hundreds or even thousands of dollars. 6. The American Gem Society Laboratory (AGS) uses the same Clarity Grading Scale and has the integrity to employ the same grading standards as does GIA. 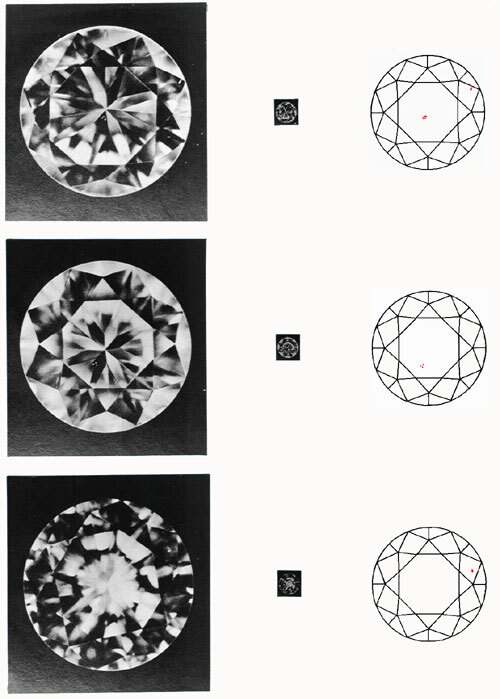 Clarity grades issued by GIA and AGS for the same diamonds are almost always identical. 7. 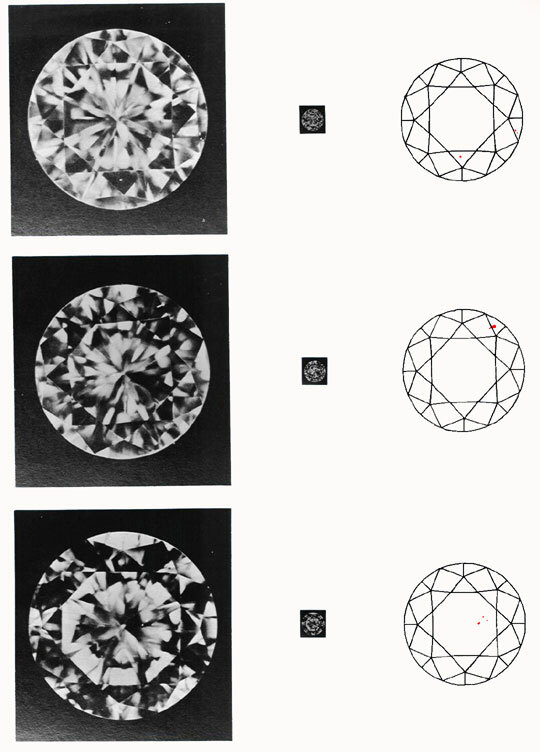 The other major gem laboratories utilize the GIA Clarity Grading Scale but employ lower standards than used by GIA. This results in the over-grading of diamonds where the clarity grade given by some laboratories will be one to up to five grades higher than the grade from GIA! There are several diamond price sheets that appraisers throughout the nation consult to estimate the wholesale value for diamonds. The Rapaport Diamond Report is likely the most widely used. 1. A 1.00 ct Round Super Ideal Brilliant Cut diamond that is a strict "D" color and "Internally Flawless" clarity from GIA or AGS would currently demand a wholesale price of $24,200 per ct.
2. A 1.00 ct Round Super Ideal Brilliant Cut diamond that is a strict "D" color and "SI2" clarity from GIA or AGS would currently demand a wholesale price of $6,900 per ct.
3. The price difference of $17,300 per carat is based entirely on the 6 grade difference in the clarity of the two stones. An honest dealer would simply advise his customers to purchase diamonds with GIA and AGS Diamond Grading Reports. The clarity grade on a diamond with these certificates would be as accurate as can be expected. In contrast an unscrupulous and predatory dealer would take advantage of the fact that almost imperceptible differences in clarity can result in a huge difference in price. The dealer would simply misrepresent the clarity grade of the diamonds he sells. If he sold the diamonds without diamond grading certificates then he could be as accurate or inaccurate as he wants. It is even easier for the dealer to hide behind the over-graded certificates in the market. An extremely deceitful dealer would choose to sell diamonds with certificates from European Gem Lab International and European Gem Lab Israel. These labs are among the worst over-graders in the world. There are other gem laboratories that use the GIA Grading Scale do not employ the same strict standards as GIA that are not as bad as European Gem Lab International and European Gem Lab Israel. Their grading is generally within one color grade and one clarity grade of GIA standards. 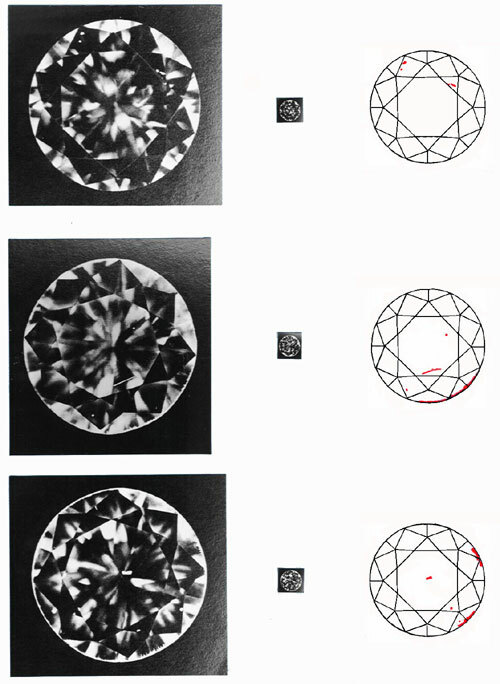 Sometimes grading reports issued by stores, "direct diamond importers" or "wholesalers" can also be highly over-graded. Also, certain clarity characteristics can greatly lower the price for a diamond. At this time inclusions that have color - either black, brown, green, grey, red etc. can bring the price for a stone down by 10 to 25%. Therefore a buyer should avoid diamonds with these types of inclusions. Watch out for the proverbial "wolf in sheep's clothing." These are dealers who have spent decades selling over-graded diamonds who suddenly claim to have always dealt in strictly graded GIA certified diamonds. 1. Abrasions: tiny nicks on facet junctions or the culet; caused by wear or by contact with other diamonds. 3. Naturals: part of the original crystal surface remaining on the polished stone, frequently in the area of the girdle. 4. Polish Lines and Marks: tiny parallel lines or surface clouding left by irregular polishing or excessive heating during polishing, respectively. 5. Rough Girdle: a grainy or pitted girdle surface usually caused by poor workmanship. 6. Surface Graining: structural irregularities in crystal growth; may appear as faint lines, causing grooved or wavy surfaces that often cross facet junctions. 2. 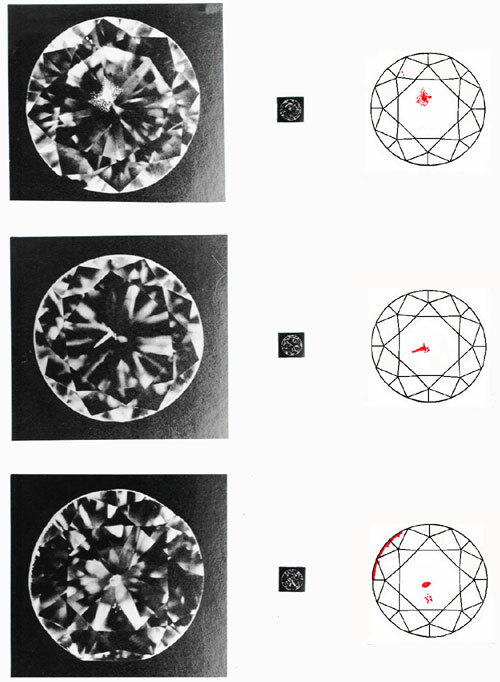 Cavities and Chips: large/deep openings, and small/shallow openings in the diamond's surface, respectively. 3. Clouds: hazy or milky areas of many very small, usually crystalline inclusions. 4. Feathers: cleavages or fractures that are often white and feathery in appearance. There are 4 cleavage planes in diamond, which run in octahedral directions. Fractures are breaks along planes other than cleavage planes and may alternate with them to form step-like feathers. 5. Included Crystals: mineral crystals, such as garnet or peridot, contained inside a diamond. 6. Indented Naturals: natural rough surfaces that penetrate the stone and may distort the girdle outline. 7. Internal Graining: regions of irregular crystal growth that may appear as milky or colored lines or streaks, or they may be reflective. 8. Laser Drill Holes: a tiny tube made by a laser; the surface opening may resemble a pit, while the tube usually resembles a needle. 9. Needles: needle-shaped included crystals. 10. Pinpoints: areas of minute, dot-like inclusions. 11. Twinning Wisps: cloudy areas produced by distorted crystal growth.